We go to the movie theater for the same reason we go to a ball game. It’s not just to see the main event. We do it to smell the smells, devour greasy food, relax with friends and family, escape the everyday, and experience camaraderie with perfect strangers. The laughter, fear, anger, sadness, and joy expressed by the collective magically heighten the experience of the individual. But something wicked this way comes. through video-on-demand systems from being copied. even while pirated copies are being made. they have threatened litigation against the movie studios. Brooke Barnes from the New York Times wrote this article about the upcoming movie industry war. SOMETIME in the next few months, there is likely to be an explosion in the movie business. The question is which studio will detonate the bomb. Tension between studios and theater owners has been simmeringa long time, but it intensified in May, when the Federal Communications Commission issued what appeared on the surface to be an arcane ruling. After two years of prodding from Hollywood, the F.C.C. agreed to let movie studios activate technology to prevent films sold through video-on-demand systems from being copied. Ho-hum? Hardly. The ruling gave studios the ability to pursue a new business — so-called premium V.O.D. — that may be the industry’s best hope of restoring itself to health, now that the bottom has fallen out of the DVD market. Right now, theaters get an exclusive period — 120 days, on average — to serve up new movies. Then the releases appear on television video-on-demand services at a price of about $4.99. Armed with the new copy-blocking technology, studios want to offer new movies on video-on-demand services about 45 days after they arrive in theaters, for a premium price of $24.99. The business opportunity is multifold. With as much as 80 percent of that early V.O.D. revenue going to the studio, movie executives see a new engine to compensate for the sputtering DVD. And for the studios, the need is urgent: DVD sales for the year are expected to total about $9.9 billion, down 30 percent from their peak in 2004, according to Adams Media Research. Studios also want to cut marketing costs by interweaving advertising for theatrical, DVD and video-on-demand releases; reducing the exclusive “window” given to theaters would make it easier to combine those campaigns. Premium V.O.D. would also bring greater consumer awareness to regular video on demand, which has not caught on as much as other rental options like Netflix, according to a research report by Anthony DiClemente, an analyst at Barclays Capital. Last but not least, studios are aware that consumers are growing impatient about being unable to access all movies whenever and wherever they want. Layering in an early video-on-demand option might prevent some of those frustrated customers from turning to pirated copies. Cable and satellite television providers like Time Warner Cable (which is no longer connected to Warner Brothers) and DirecTV are ready to push the button on premium V.O.D. as soon as they reach a deal with studios. After all, the service would represent another revenue stream for these providers and another way to differentiate themselves with customers. The promise of the new business is one reason that Comcast is so eager for government regulators to clear its deal to take control of NBC Universal, analysts say. SO what’s the problem? DVD retailers, for a start. The likes of Best Buy and Wal-Mart“have told studios they will retaliate against anyone who tries early-release V.O.D. because of the threat it poses to DVD sales,” Richard Greenfield, an analyst at the financial services company BTIG, wrote in a research note last Monday. But the real wrath will come from theater owners, who have made it clear that releasing a movie early on video-on-demand services — thus cutting into their window — would be the equivalent of declaring war. Over the summer, the National Association of Theater Owners took out full-page ads in Variety and The Hollywood Reporter making its opposition clear. 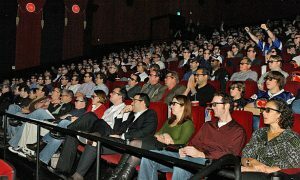 The worry for theaters, of course, is that people will be more reluctant to buy movie tickets, at an average cost of almost $8, if they know they can catch the same film just a few weeks later in their living rooms, and for less money than it costs to haul the whole family to the multiplex. Considering that the average moviegoer spends more than $3 on popcorn and soda and the like, the cost of Friday night at the movies for a family of four can easily reach $45 — or much more in cities like New York — even before premium-priced 3-D screenings or possible parking fees are factored in. The Big Three theater chains — Regal Entertainment, AMC Entertainment and Cinemark — declined to comment, but smaller theater companies have been more vocal. “Be careful before you cook us all, yourselves included,” wrote Gregory S. Marcus, the chief executive of the Marcus Corporation — the parent of Marcus Theatres, a Midwest exhibitor — in a July opinion article in The Hollywood Reporter. Exhibitors are also arguing that the copy-blocking technology approved by the F.C.C. won’t work. “If past is prologue, technological locks will be overcome with technological crowbars,” the ads from the National Association of Theater Owners stated. Theater owners mean business. When Sony Pictures Entertainment tried a test with“Cloudy With a Chance of Meatballs” last year — owners of Internet-connected Bravia televisions could rent that movie before it was available on DVD, for $25 for a month — some theaters yanked the film. In a similar showdown, Disney’s decision last spring to release “Alice in Wonderland” early on DVD was greeted by boycott calls from theater owners, most forcefully in Britain. Studio executives say they are going to risk premium V.O.D. anyway, contending that they have little choice, given the DVD downturn. Besides, analysts estimate that 90 percent of a film’s admissions revenue is now generated within 30 days of its release. Protecting the box office is crucial for studios, and for reasons beyond the importance of their ticket-revenue share. For a start, under long-term contracts, premium television networks like HBO and Showtime typically pay for movies using formulas based on domestic box-office revenue. So shrinking ticket sales would also mean shrinking television revenue. 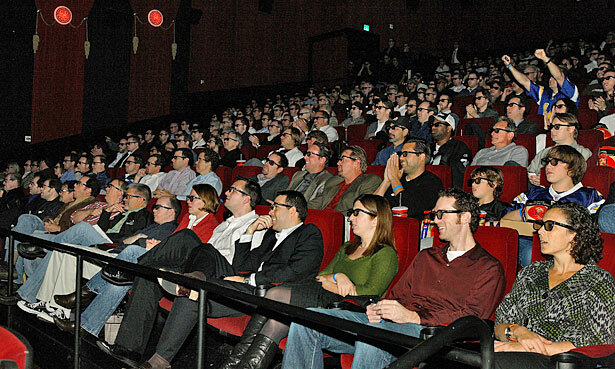 Studios also rely on big theatrical runs to catapult titles into the public consciousness. Without all of the hoopla surrounding a hit at the multiplex — the lines, the marquees, the buzz in the corridors afterward — movies start to feel an awful lot like their more commodified cousin, television. SO which studio is going to go first, and when? All six of the major studios declined to comment for this article. But multiple movie executives with deep knowledge of the landscape say the first quarter of next year is the target, in part because big Christmas releases like “The Chronicles of Narnia: The Voyage of the Dawn Treader” and “Tron: Legacy” give studios extra leverage. The studios that seem most likely to make a move are Disney, 20th Century Fox and Warner Brothers. In part because its size gives it more muscle than other studios, Warner has historically shown a willingness to rewrite the blueprints for the home entertainment business. It was Warner, for instance, that aggressively pushed to release movies on traditional V.O.D. at the same time the DVDs arrived in stores. Bluray/DVD Releases For The 1st Week Of December!!! This entry was posted on Sunday, September 26th, 2010 at 12:02 pm	and is filed under News. You can follow any responses to this entry through the RSS 2.0 feed. You can leave a response, or trackback from your own site.